LIDO is architecturally inspired to fit the community and the people in it. Standing proud on the corner of 10th Street and 2nd Avenue NW, it will transform the streetscape of 10th street Kensington into a vibrant and sophisticated space that will benefit residents, businesses, and visitors alike. During the early 20th century Tenth Street was a thriving commercial street. Over the past 20 years, The Dobbin Group has been restoring Kensington to its former glory. 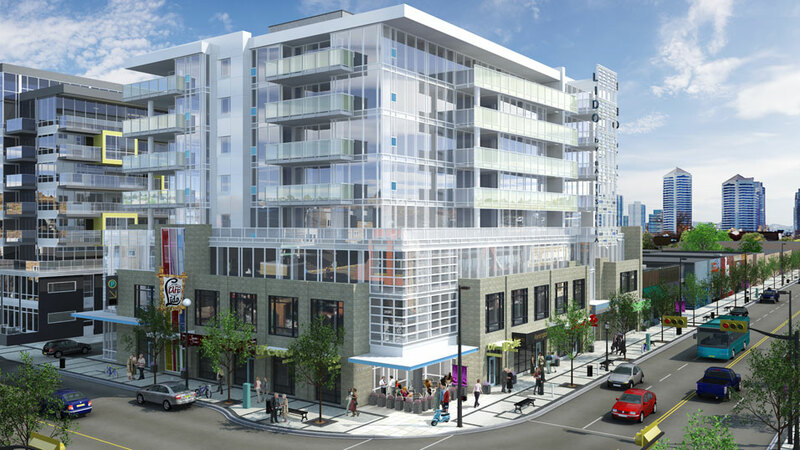 The LIDO site was bought by the Calgary Parking Authority a number of years ago to increase the parking capacity in the Kensington area; however a mixed-used project was suggested in order to add greater vibrancy. The collaboration between The Dobbin Group and Battistella Developments is destined to become a landmark on Tenth Street. Throughout the years the site has housed many businesses, including Ant Hill Fabrics, and since 1962, the Lido café. The Lido café, a Chinese and breakfast diner, is well-known among the locals and has a place in people’s hearts. The business owners are now retiring, but the LIDO name and the iconic Lido sign will live on.